On its Instagram account, @inuktitut_ilinniaqta, the group posts collage art to illustrate Inuktitut vocabulary in whimsical ways. (Think: wolf heads snarling at overpriced Nunavut groceries, or a polar bear in a hoodie, cutting a cool figure against the Aurora Borealis, with his arm outstretched dramatically to signal Stop!) The captions feature words and phrases, with English translations, that relate to the collage. All together, the posts make for an edgy set of virtual flash cards. 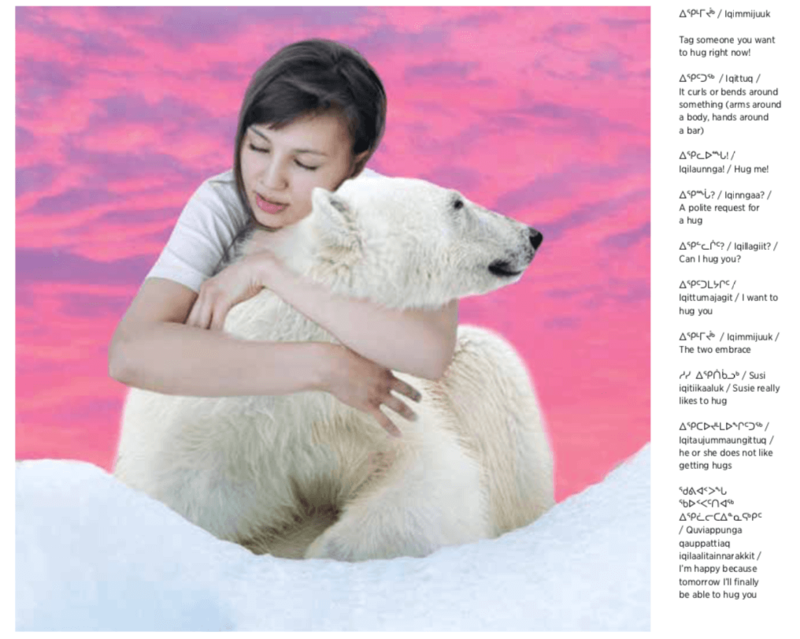 “The more engaging the image is, the more likely you are to remember the Inuktitut examples that go with it,” says Demeester. Since Inuktitut Ilinniaqta’s first Instagram post in 2016, the learning resource has branched out to Facebook and Twitter. The group also synthesizes and expands on their posts through the Inuktitut Ilinniaqta blog, categorizing them alphabetically and by subject. Although Inuktitut Ilinniaqta is known for its lighthearted visuals, Demeester hopes to add audio soon, to enhance the language learning process. The group is currently writing and recording 15 interactive Inuktitut lessons for release later this year.